I have a scenario where each page of a site has a checkbox for "is in header" and "is in footer". The universe of items that needs to be traversed is a couple of hundred in nature, and I'm looking for the most efficient way to retrieve them. Currently, I'm using foreach loops, but there's four levels of hierarchy I need to go through, so going through the children of each is not the most efficient method and takes a few seconds per page load. I've got caching on the rendering going, but while that hides the issue, it doesn't solve it from a code perspective. I've been looking at Sitecore Query and the like as an option as well. I know fast query won't work because the data won't maintain its hierarchy, but I also see that Sitecore Query is slow. Also, I read that using Axes.Descendants and the like is slow as well. One thought I had was to read the entire tree into a single object and cache it with .NET caching, but then there's an issue of security rights for a particular user...you'd need to use the SecurityDisabler to get the whole universe, then when outputting it somehow compare the logged-in user to the tree and exclude anything they don't have read rights to. The last option might work, if someone can point me in that direction for manually checking if a user has rights to an item. Beyond that, does anyone have a suggestion for running this efficiently? The question is quite broad and there are many ways you can achieve this obviously (you mentioned sitecore query and foreach loop). Another option would be to use the sitecore content search (with rendering cache on top, of course). So, you can define your custom POCO object with IsInFooter and IsInHeader fields and query your index. There are only two viable options; short of simply not building up navigation structures in this manner. I would normally have any form of navigation being components of their own, and have a menu hierarchy of navigational items define what they show. But that's a separate story. As already demonstrated by @Andrey Bobrov. Performance wise, this is your second best option. But you would need to change your two Checkbox fields to one Multilist field, where you would then "tag" your items with "HeaderNavigation" and "FooterNavigation". Advantage being; you could then easily expand upon this taxonomy later, should you desire. Once tagged like this, you could retrieve the required items using LinkDatabase, which would outperform any other option. Use Sitecore Query at runtime. That includes fast:/ query. I am going to approach this from a different perspective than the code channel. And focus on the performance building the footer on the server and the rendering speed. Build your footer using the best code practices that fit into your organization optimizing as much as possible. And then you cache the output of the footer rendering using Sitecore rendering caching options. You did mention that you might be security trimming pages based on a users permissions. 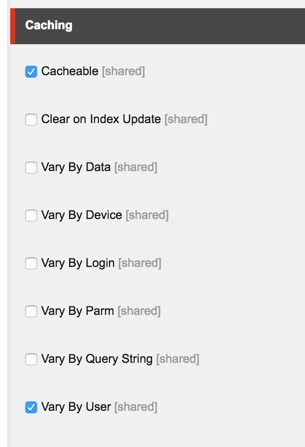 In that case you can set the key for caching to be by user. When a user publishes to the CD server, the cache will be cleared and the footer will re-render. So I accepted an answer because I think it's the overall best one, but I wanted to share a solution I came up with. It involved keeping the foreach loops nested, but moving it to a static class that's cached with MemoryCache for an hour. I use SecurityDisabler to ensure I'm getting the entire tree and passing the values I need into my own POCO. Where user is the Sitecore.Context.User. This is working as I'd expect, and the speed of the page load is comparable to using the Sitecore rendering caching (cacheable and cache by user, as suggested in another answer). The one advantage is that instead of each user having to get spun up once before the rendering hits, only the first user in gets the small hit, then everyone benefits. I'd be curious to others' thoughts on this. I know I'm describing a bit abstractly, but everyone's given some great feedback on the topic. Not the answer you're looking for? Browse other questions tagged caching sitecore-query or ask your own question.